Back to back manic days as the markets continue to struggle with poor macro economic news and mostly positive earnings. Today it was “risk on” as Microsoft, Caterpillar and UPS earnings were cheered while Amazon missed, housing reports and unemployment all were negative. Chairman Bernanke continued his commentary on Capitol Hill but today, unlike yesterday, the markets rallied. Jobless benefits were extended by Congress. Tomorrow brings earnings reports from Ford and McDonalds and the long awaited “stress tests” designed to show the health of the European banks. For the weekend, we have a tropical storm heading for the BP well in the Gulf of Mexico and apparently the well be unattended and operations will stop. There are all kinds of varying forecasts about what will happen that range from nothing to a methane rain over the Gulf Coast. 1100 on the S&P remains formidable resistance as does the 200 Day Moving Average at 1113 just above today’s close. Point and Figure charts remain on “sell” signals but close to changing. This is a titanic struggle that will resolve one way or other over the coming days. 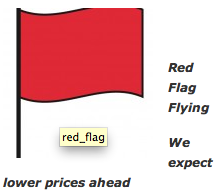 We remain in the “red flag” mode, expecting lower prices ahead. Read our weekend newsletter, Wall Street Sector Selector Review, for full market updates and analysis.